I’ve been receiving a lot of request in my inbox for a skin care routine, it is initially the "essential" post to publish for every blogger but I've always avoid writing it for the soul reason that I don't have the perfect skin nor have a proper and constant routine to pamper my skin. Hence, giving advice on how to would not be the priority goal, this post simply share the day to day routine and the products I use. With that out of the way here is my skin care routine. My face wash is varied from a lot of different brands and although I’m inconsistent with the type and brand my skin seem to be unaffected. My face is extreamly dry but not the slightest sensitive, hence changing face wash isn’t as impactful. Currently using is the Olay total effect 7, I’ve used this brand in the past before and it works just fine. This one is less foamy which i’d prefer because the more foam the more mess. 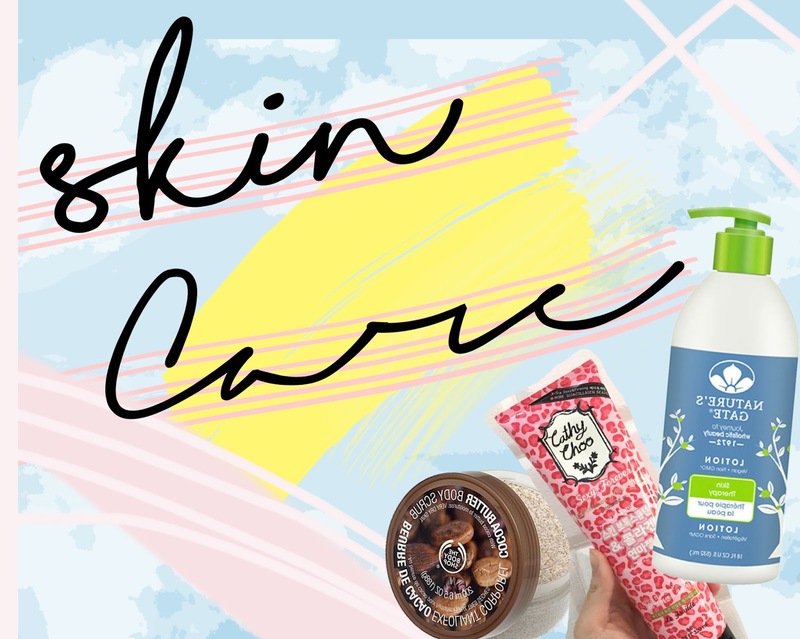 This brand opens up the pores a lot more than other brands, something I find very appealing because that means as you apply moisturiser your skin will have more volume to absorb the vitamins and minerals. Different from my face wash I stayed faithful with the face cream I’ve been using for almost a year and a half. Avène is a European brand but in Indonesia you can easily find it department stores. The one I use is the light and hydrating cream it is around $40 a little bit pricier but I believe that anything applied on the skin is an investment. This one is both my day and night cream because I don't think I my skin need extra protection just yet. The texture is very light and it does not leave your face sticky, leave it on for 5-10 minutes to dry up. Avène contains SPF 20, and because I’m mostly indoors SPF 20 is more than enough because unwritten standard for face cream is a minimum of SPF 15. Another reason why SPF 20 is the best amount to go for is because the higher the number the more oily and shiny your face is going to look like. I don't usually reapply face crams but in days I do it’ll most likely be because I washed my face again and needed the face cream to act as a seal. Vaseline is just an essential, I don't usually wear them day time as they do tend to spread make the perimeter of the lips shinny. I apply vaseline right before I sleep because over the course of 7 hours they will moisturise and exfoliate the lips so you wont have to reapply them in the morning. I keep a tin of vaseline in my night stand to remind myself to apply them. I use the candlenut oil every other day because they do have a slight smell and although they work wonders I just can’t justify the smell. I apply them in my spars patches of my eyebrows and sometimes eyelash. They will fertilise and stimulate hair growth. Another thing to take note of is that applying them everyday is not only a hassle but they do trigger acne, so apply them considerably. The body lotion I use changes a lot because again my skin seem to be unaffected. Currently I’m using Nature’s Gate skin therapy, hands down my favourite body lotion. It does not have a sweet sent but it’s incredibly moisturising and most importantly it is in no way sticky. Nature’s Gate it 100% organic and is purely created out of good cause, no they are not sponsoring this post if thats what you think. My body scrubs are always from the body shop. The one I’m currently using is the coca-butter sent and I do not recommend this fragrance. My mom bought this for me and she lost the recite to exchange them so I’ll be using them for now. Aside from the smell it works great, like any body scrub they leave your skin extremely soft. Routinely I’ll apply them every 3-4 days as I want to give time for my skin to recover. I’m not even sure if there is such things as a dry scrub but this one seem to be it. The one Ihave is from cathy choo, I’ve mentioned this before in one of my monthly favourite posts but here it is guess starring again. Generally they are a gell like consistency that you apply on your skin, keep in mind that you need to be absolutely dry preferably do this before you shower. Apply them on your skin and start scrubbing like you do with normal scrubs, then you’ll start to see strands that look a lot like an eraser’s residue and that is the dry skin you’ve clumped and gathered, wipe the residue then take your shower. I recommend this product, it’s simplicity and result is amazing. I dont dont use them as much as I’d like to just because they do take up a lot more time to soak in. This one is actually a serum my aunt made for me and I’ve been using them a lot for the past months. Simply slather the serum and let them soak in for 30-40 minutes before rinsing them off. This will exfoliate and make sure your skin is developing in a clear and clean environment or in other words is clears the pores. And that is it, I’d like to mention one this before ending this post and that is to address my email address. I only have one email published here purposely for blogging and you are welcome to contact me through that email (hilarynirvanaa@gmail.com) anytime, sending me mails to my private email will most likely be skipped and un-replied not because I don’t want to but because they go directly to spam and I don't regularly check my spam box, hence why I don't publicly mention my private email on my blog because I’d like to write and reply to all of the emails you sent me. Another thing is, yes I do reply to every single email so if I haven't write back to you then I’m still otw of writing it:) On that note, thank you for reading and I’ll write to you soon.